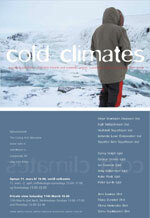 "Cold Climate" 16th March - 9th April 2006. 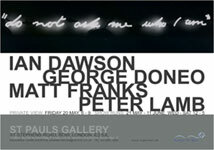 Curated by Peter Lamb and George Doneo. "MIMOID" 28th January - 17th March 2006. Dan Coombs, Ian Dawson, George Doneo & Peter Lamb at Limehouse Arts Foundation. St Stephens Road, Bow, London. "Green Drum", Napoleon Gardens, Holland Park.